Using good imagery is essential for keeping participant’s interest, looking professional and maintaining faith in the hunt. If there is any ambiguity or weak images people taking part will feel disproportionately let down as their expectations for such a novel activity are very high. The best images to use are manipulated ones of your actual venue where hunters can engage with the jiggery pokery presented before them first hand. 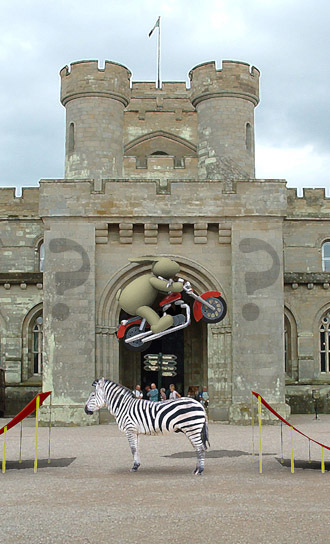 This example is taken from the Eastnor Castle EGGstreme Treasure Hunt – were we can see a painting of a rabbit on a motorbike jumping over a zebra*. If it looks rubbish – then people will think it is rubbish. If you make it look like the business – then people will think it is the business. *We can assure you that no animals were injured in the making of this photo.